A 30,000-year-old finger bone found in a cave in southern Siberia came from a young girl who was neither an early modern human nor a Neanderthal, but belonged to a previously unknown group of human relatives, called "Denisovans" after the cave where the fossils were found, who may have lived throughout much of Asia during the late Pleistocene epoch. Although the fossil evidence consists of just a bone fragment and one tooth, DNA extracted from the bone has yielded a draft genome sequence, enabling scientists to reach some startling conclusions about this extinct branch of the human family tree. Comparing the Denisovan genome sequence with the genomes of Neanderthals and modern humans, the researchers determined that the Denisovans were a sister group to the Neanderthals, descended from the same ancestral population that had separated earlier from the ancestors of present-day humans. The study also found surprising evidence of Denisovan gene sequences in modern-day Melanesians, suggesting that there was interbreeding between Denisovans and the ancestors of Melanesians, just as Neanderthals appear to have interbred with the ancestors of all modern-day non-Africans. "The story now gets a bit more complicated," said Green, an assistant professor of biomolecular engineering in the Baskin School of Engineering at UC Santa Cruz. "Instead of the clean story we used to have of modern humans migrating out of Africa and replacing Neanderthals, we now see these very intertwined story lines with more players and more interactions than we knew of before." The Denisovans appear to have been quite different both genetically and morphologically from Neanderthals and modern humans. The tooth found in the same cave as the finger bone shows a morphology that is distinct from Neanderthals and modern humans and resembles much older human ancestors, such as Homo habilis and Homo erectus. DNA analysis showed that the tooth and the finger bone came from different individuals in the same population. 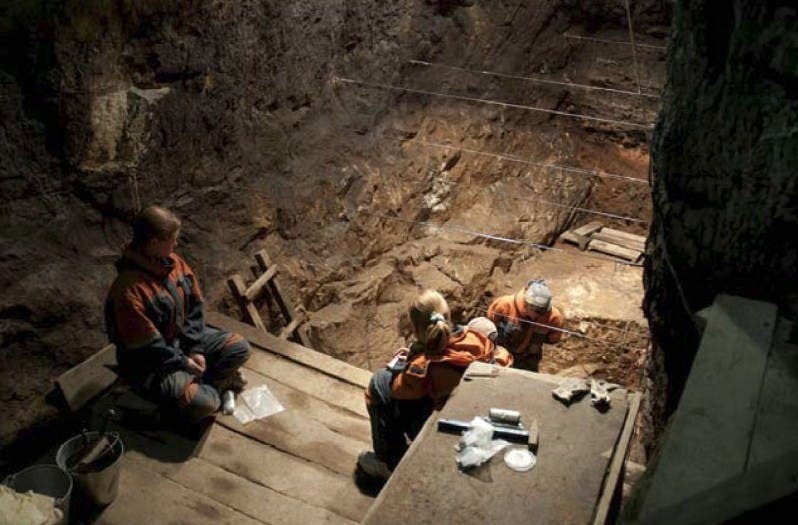 The finger bone was found in 2008 by Russian scientists in Denisova Cave, an archaeological site in southern Siberia. Pääbo, who had worked with the Russian scientists before, obtained the bone for his research on ancient DNA. In Leipzig, researchers extracted DNA from the bone and sequenced the mitochondrial genome, a smaller DNA sequence separate from the chromosomal DNA and easier to obtain from ancient samples. The results, published earlier this year, showed a surprising divergence from the mitochondrial genomes of Neanderthals and modern humans, and the team quickly began working to sequence the nuclear genome. "It was fortuitous that this discovery came quickly on the heels of the Neanderthal genome, because we already had the team assembled and ready to do another similar analysis," Green said. "This is an incredibly well-preserved sample, so it was a joy to work with data this nice. We don't know all the reasons why, but it is almost miraculous how well-preserved the DNA is." The relationship between Denisovans and present-day Melanesians was a completely unexpected finding, he said. The comparative analysis, which included genome sequences of individuals from New Guinea and Bougainville Island, indicates that genetic material derived from Denisovans makes up about 4 to 6 percent of the genomes of at least some Melanesian populations. The fact that Denisovans were discovered in southern Siberia but contributed genetic material to modern human populations in Southeast Asia suggests that their population may have been widespread in Asia during the late Pleistocene, said David Reich of Harvard Medical School, who led the population genetic analysis. It is not clear why fossil evidence had not already revealed the existence of this group of ancient human relatives. But Green noted that the finger bone was originally thought to be from an early modern human, and the tooth resembles those of other ancient human ancestors. "It could be that other samples are misclassified," he said. "But now, by analyzing DNA, we can say more definitively what they are. It's getting easier technically to do this, and it's a great new way to extract information from fossil remains." In the light of the Neanderthal and Denisovan genomes, a new, more complex picture is emerging of the evolutionary history of modern humans and our extinct relatives. According to Green, there was probably an ancestral group that left Africa between 300,000 and 400,000 years ago and quickly diverged, with one branch becoming the Neanderthals who spread into Europe and the other branch moving east and becoming Denisovans. When modern humans left Africa about 70,000 to 80,000 years ago, they first encountered the Neanderthals, an interaction that left traces of Neanderthal DNA scattered through the genomes of all non-Africans. One group of humans later came in contact with Denisovans, leaving traces of Denisovan DNA in the genomes of humans who settled in Melanesia. "This study fills in some of the details, but we would like to know much more about the Denisovans and their interactions with human populations," Green said. "And you have to wonder if there were other populations that remain to be discovered. Is there a fourth player in this story?" The findings are reported in the December 23 issue of Nature by an international team of scientists, including many of the same researchers who earlier this year published the Neanderthal genome. Coauthor Richard Green of the University of California, Santa Cruz, played a lead role in the analysis of the genome sequence data, for which a special portal was designed on the UCSC Genome Browser. The team was led by Svante Pääbo of the Max Planck Institute for Evolutionary Anthropology in Leipzig, Germany.